Snake River steelhead, an Endangered Species Act listed species, will benefit from a collaboration of groups in Idaho that once worked against each other. Trout Unlimited photo. Looking around the West, it is easy to find watersheds where people are fighting over too little water. In Idaho, a group of partners decided to forge a different path – one where not everyone will get everything they want, but everyone will get what they need. The Lewiston Orchards Water Exchange and Title Transfer project represents an excellent example of the process Trout Unlimited has found achieves the most successful and long-lasting results, namely, a collaboration where all interested parties come together to craft comprehensive solutions. It wasn’t easy. Years of court battles preceded this partnership. It wasn’t until 2008, when a community leader, Jerry Klemm, organized a series of stakeholder meetings to identify potential alternatives. He invited representatives from the Lewiston Orchards Irrigation District, the Lewis Clark Valley Chamber of Commerce, the Nez Perce County Commissioners, the Nez Perce Tribe and the City of Lewiston to work together. Out of those talks came consensus and a project partnership, the formation of the Lower Clearwater Exchange Project (LCEP), with the signing of a Memorandum of Understanding (MOU) in June 2009 and letter of support from the Bureau of Reclamation. This map from the Bureau of Reclamation shows the location of the Lewiston Orchards Project. The Lewiston Orchards Project provides irrigation water to approximately 22,000 patrons and includes four diversion structures, three small storage reservoirs, and a water distribution system. 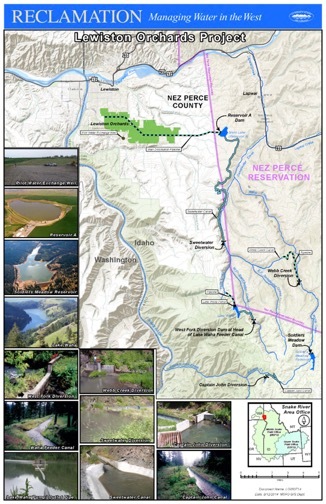 Many of its facilities are located on, and adjacent to, the Nez Perce Reservation. Snake River Basin steelhead, an Endangered Species Act listed species, are found here. The project’s operations directly impact these fish as well as other tribal resources. The Sweetwater Diversion will come down as part of the Lewiston Orchards Project. Courtesy photo. At the beginning, the parties agreed on three core objectives to guide their discussions. These points were ultimately agreed upon and documented in the MOU. Create a reliable, quality water supply for the irrigation district. Permanently resolve the ESA issues. Permanently resolve the federal-tribal trust issues. The partners crafted an innovative water exchange that involves incrementally exchanging the existing surface water system with an off-reservation groundwater-pumped system consisting of multiple wells. The wells will be constructed in phases as funding becomes available. Each well will be connected to the Lewiston Orchards Project system in exchange for an equal amount of surface water returned to streams. This project will restore flow reliability to streams in the Lapwai Watershed, including Sweetwater Creek, a tributary to the Clearwater River. Because of the unique characteristics of Sweetwater Springs, the biological value of these streams for steelhead is very high and the project likely will contribute to increase the resilience of steelhead to climate change impacts. Waters like Webb Creek will see increased flows as a part of the Lewiston Orchards Project. Courtesy photo. “We are excited about what this collaboration is already producing and how it shows what can be accomplished when we come together to work towards a common goal,” said Roland Springer, Reclamation Snake River Area Manager. Kira Finkler is the Idaho Director of Trout Unlimited’s Western Water and Habitat Project. She is based in Boise.